We’ve now had 3 trouble free days of towing. This is our third time in Santa Fe—the first time in winter. 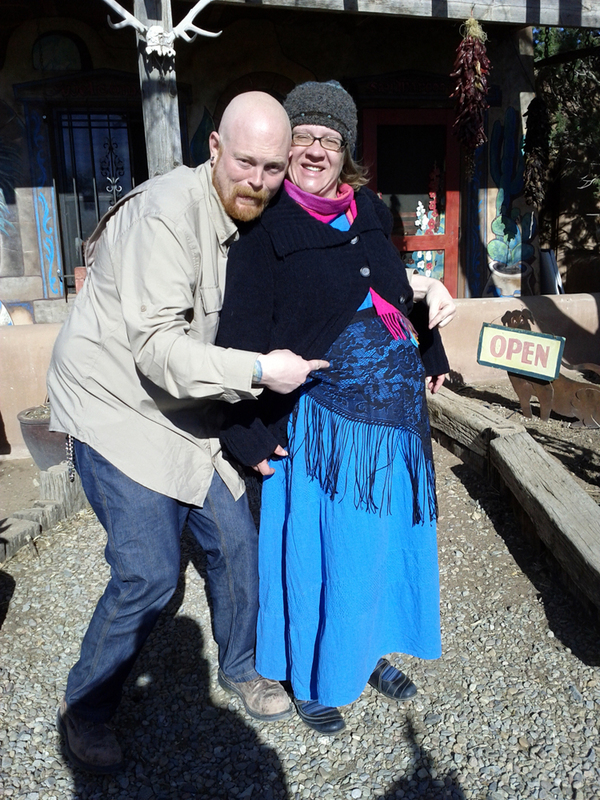 We love Santa Fe and we have a nephew and niece living here (and an in-process grandnephew or grandniece). We spent slightly over two weeks at Santa Fe Skies RV Park, an excellent campground perched on the side of a hill just south of the city. There was nothing to interrupt either the view or the wind. We had several good times with Dylan and Nica, including trips to old favorite and new favorite restaurants, particularly one where we ran a gantlet of peafowl, turkeys, and roosters to get to the door. We attended a grillstravaganza at Dylan and Nica’s home where we got reacquainted with Skeksis (the Cat), were—very carefully—introduced to Ogre and Trout (the Dogs), and each ate about six pounds of meat excellently grilled by Chef Dylan. Dylan also took me to an outdoor shooting range where we merrily poked holes in paper and splintered plywood—big fun, I haven’t been to an outdoor range in years. Turns out you can’t get ammo for anything but Farquharson Rifles these days. I’m apparently out of touch with current events re: ammunition availability. One of the most interesting restaurants we went to on our own was a Japanese place called Shibumi Ramenya. The Tonkotsu soup was delicious—Nan and I both dislike kimchi but are certain there was a dollop of it in the soup and we both loved it. The odd thing about Shibumi Ramenya is their body odor policy. You wear any kind of fragrance, from perfume to cologne, you are given the boot—no exceptions. It’s a food purity thing, apparently. One wonders if they would exercise the policy if you came in right after a hot sunny day on the manure wagon. We got to know Nica’s mom, Cheryl, a lady of Norwegian heritage who appreciated my “Show Me the Lefse” t-shirt. She’s volunteered to help me with my genealogical research once we get our internet solution in place. 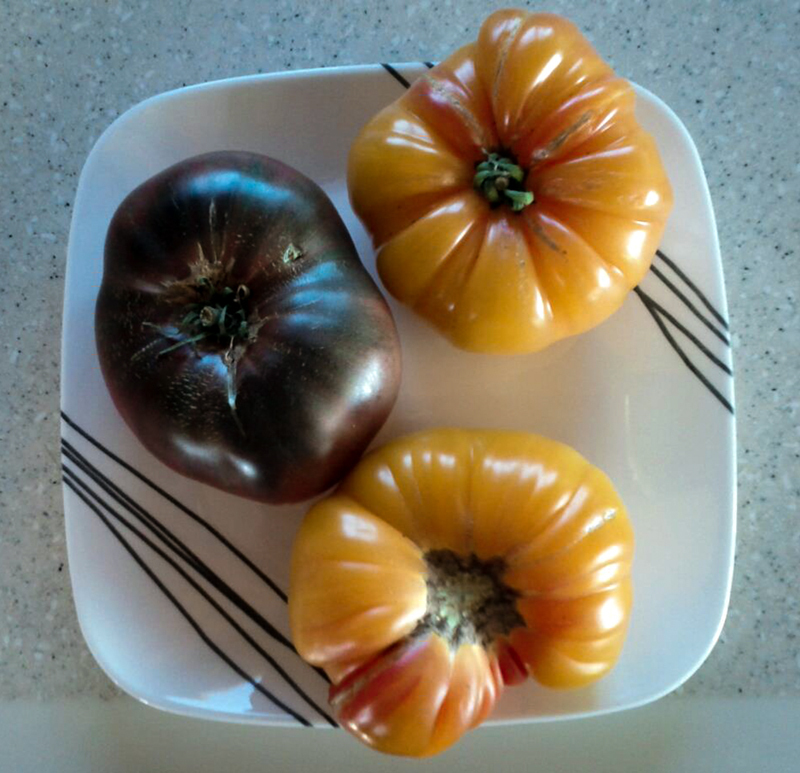 We haunted the Santa Fe Farmers Market and scored some remarkably good heirloom tomatoes. We also went to the adjacent Flea Market where we found many high-quality fleas. Alas, only some jewelry fleas were small enough to take home with us. I actually did some “writing” writing while we were in Santa Fe. NaNoWriMo scheduled a one-day marathon for April 13th so I used the day to finish a chapter in the book that had been giving me trouble since November. Now to explain the post subtitle. OK, it didn’t happen at 7 pm and it wasn’t a main hatchway and it didn’t cave in, but grant me some artistic license; I can’t resist the Wreck of the Edmund Fitzgerald reference in the title of this post. Dylan had warned us that Santa Fe could be windy at this time of year. While we were there his prediction was borne out several times. After a particularly windy night I was standing beside the Edmund performing my favorite chore—dumping the black and grey water tanks—when I noticed a smashed fiberglass cowling lying in the unoccupied site next to us. I was engaging in a little harmless Schadenfreude, wondering which poor devils had lost a piece of their RV during the windstorm, when it dawned on me that we were the poor devils in question. The cowling, what was left of it, had blown off our bedroom air conditioner leaving the unit exposed to the elements. Fortunately the weather forecasts in Santa Fe hadn’t included any significant precipitation yet, so I felt like I had a little time to figure out a solution. We had no way to get to the roof; our ladder wasn’t long enough. I didn’t want to buy another ladder—anything long enough to get me to the roof would take up a big chunk of space in the basement—space we didn’t have. A few days later, “fortunately,” our electrical power failed and we had to call a mobile repair service to tell us why the Edmund didn’t think it was plugged into shore power even though it clearly was. While they were there I was able to borrow their ladder and duct tape a blue tarp over the air conditioning unit until we could effect a permanent fix. Looks classy, no? By the way, the electrical problem was solved by rebooting the device that converts the DC current from batteries to run our AC appliances (the inverter). It would appear the default IT solution sometimes applies to RV electrical systems. 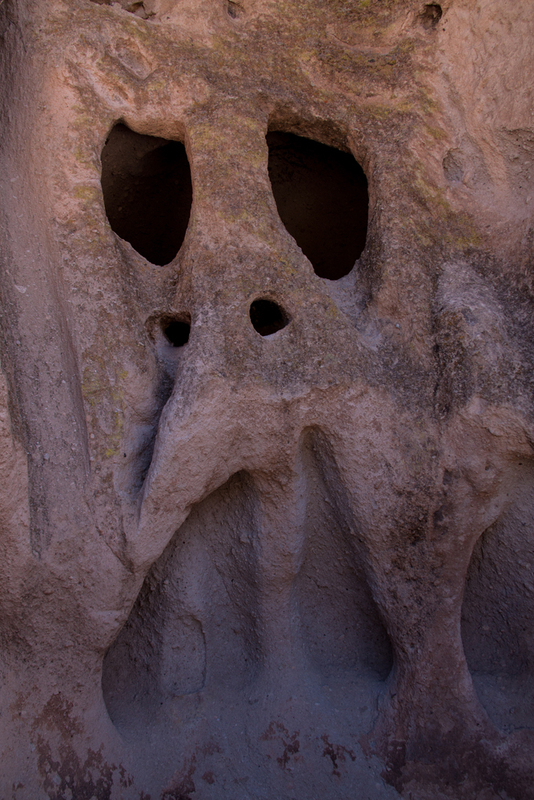 Our main field trip was to Bandelier National Monument. 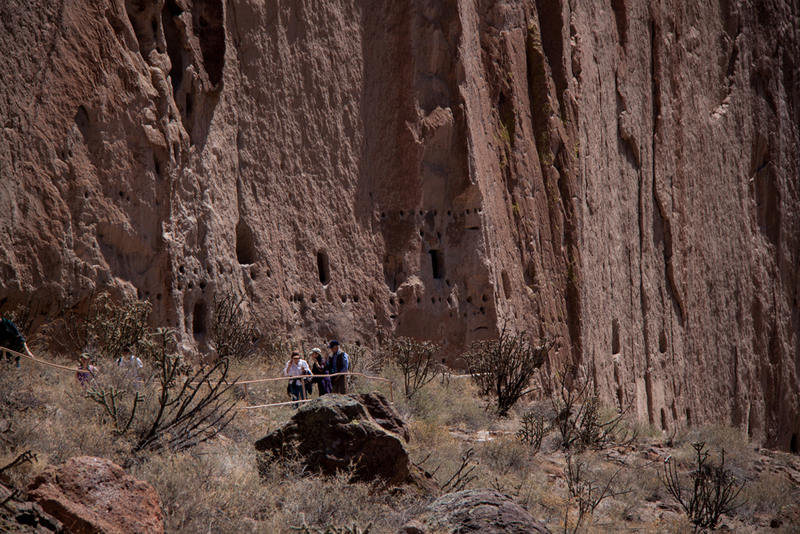 The main points of attraction for us at Bandelier were the Ancient pueblo sites found in the Canyon of the Beans along the Main Loop Trail, an easy 1.2 mile hike starting at the Visitor Center. 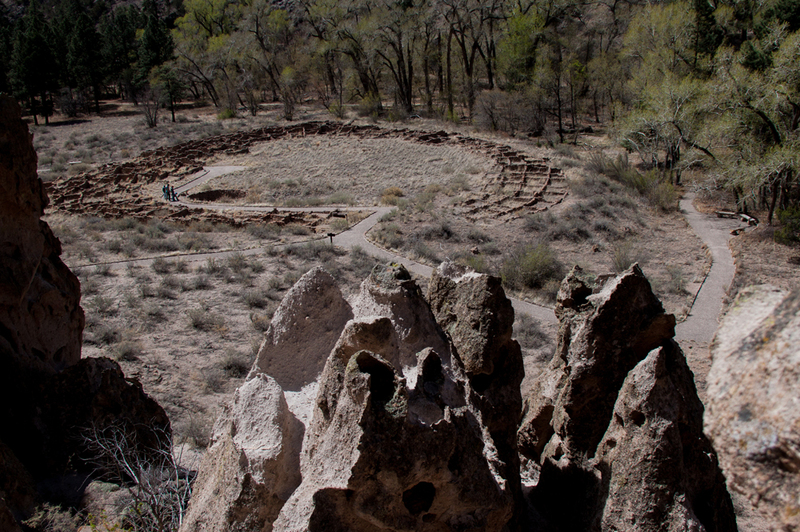 The largest site is the ruin of a circular pueblo that once stood 1-3 stories tall. It’s called Tyuonyi (pronounced absolutely nothing like it’s spelled, it doesn’t even start with a “T” sound). The canyon walls are made of volcanic tuff, stone formed from the ash of a volcanic eruption that took place a million-plus years ago. Tuff is the opposite of tough; the stone has eroded into some very eerie shapes. The Ancient Pueblo Peoples Formerly Known as Anasazi took advantage of the soft stone to build into the side of the canyon. They would enlarge voids in the stone created by erosion to make rooms such as this—a reconstructed space that needs to be “smoked” every few years by the Park Service to cover modern graffiti. They also drilled holes to anchor wooden beams used in the construction of multilevel dwellings against the cliff face. The canyon was inhabited by the Ancient Pueblo Peoples from about 1150 CE and abandoned by around 1600 CE, probably because drought and warfare pushed them south to the Rio Grande valley. We had a lot of fun in Santa Fe; it’s another place we hated to leave. 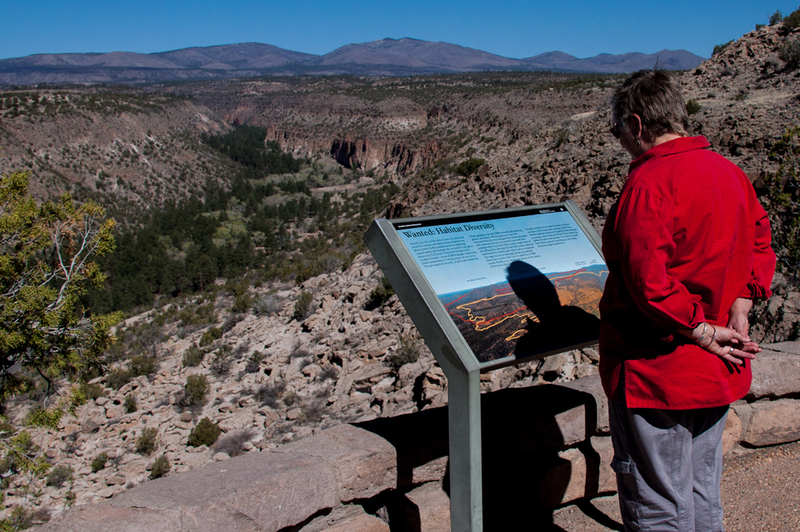 We’re planning to add it to the 2014 SW loop for a longer stay. On to Colorado Springs to visit Sarah, Aubrey, Bob, and the A-Team. Then we’ll see how close we can get to the Cheyenne Mountain Nuclear Bunker. Note: the above picture links of Sarah, Aubrey, Bob, and the A-Team are six years old. I suspect Aubrey and the A-Team will have changed quite bit. I suspect Sarah and Bob will both look as young as ever.